Bucilla GINGERBREAD HOUSE Felt Christmas Kit 2005. 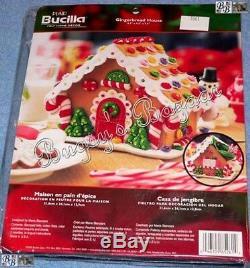 This is a New and never opened Gingerbread House Felt Christmas Decor Kit by Bucilla, and item #85261. Sequins and beads add sparkle to this delicious looking kit! Time to start stitching for Christmas! Better than a luscious Gingerbread House. Decorated with colorful sequin candies, this beautiful centerpiece doubles as a place to store Christmas goodies (see inset picture). This beautiful Gingerbread House that is sure to become treasured heirloom. The finished size is 8.5 x 9.5 x 5.5 (21.6 x 24.1 x 139 cm). Color separated Sequins and Beads. Designed by Maria Stanziani, the kit is copyrighted 2005 Bucilla Corp. The outer package has shelf wear and a hole where a tag was removed - all inside is fine. A BEAUTIFUL ADDITION TO YOUR CHRISTMAS DECORATIONS OR A WONDERFUL GIFT! THANKS FOR LOOKING and GOOD LUCK!! Special care is taken when we pack your items, however we have no control over the shippers we use. They are determined by actual weight and buyers zip code. All Payments to be made in US Dollars. Any items that are not paid for within 7 days will be re-listed. The item "Bucilla GINGERBREAD HOUSE Felt Applique Christmas Decor Kit 2005 85261" is in sale since Tuesday, July 3, 2018. This item is in the category "Collectibles\Holiday & Seasonal\Christmas\ Current (1991-Now)\Other Current Christmas Décor". The seller is "bugsysbazaar" and is located in Bridgewater, New Jersey.